This is not my first attempt at the Amy Butler “Frenchy Bag.” As I posted here, I started with the smaller in order to make use of the scraps from my wedding-guest-welcome-bag project. After making a few of the smaller ones, I decided the larger size would likely make a more practical bag. I had to break into the bolt of Burberry rainwear we had hidden in the back of the hall closet since the scraps I typically pulled from were too small. The result was the bag shown in the photo above. The sewing was straightforward given my history with this pattern. And, just as expected, this bag is the perfect size to hold books, magazines, or papers for work. Again, instead of self-fabric handles, I used webbing left over from the wedding guest welcome bags. I wish I’d had the time to make a bag like this for each of our wedding guests. I like how it takes advantage of the stripes on the Burberry fabric, recalling the more traditional Burberry plaid. I want to make one more jacket lined with this Burberry rainwear, an ivory raincoat. 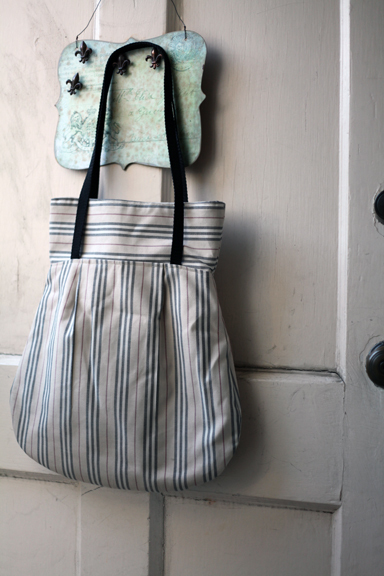 Then, if I have enough fabric left over to make another one of these large Frenchy Bags, I will be making another. I think it would make a great gift.